The sweet little dolls adorning the edge of this darling doily brings to mind a special childhood friend that every little girl treasures -- her favorite dolly. 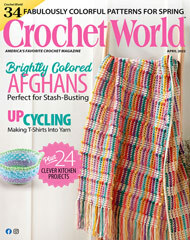 This e-pattern was originally published in the July 2010 issue of Crochet! magazine. Size: 12 1/2" diameter. Made with size 10 crochet cotton thread and size 9 (1.25mm) steel hook.